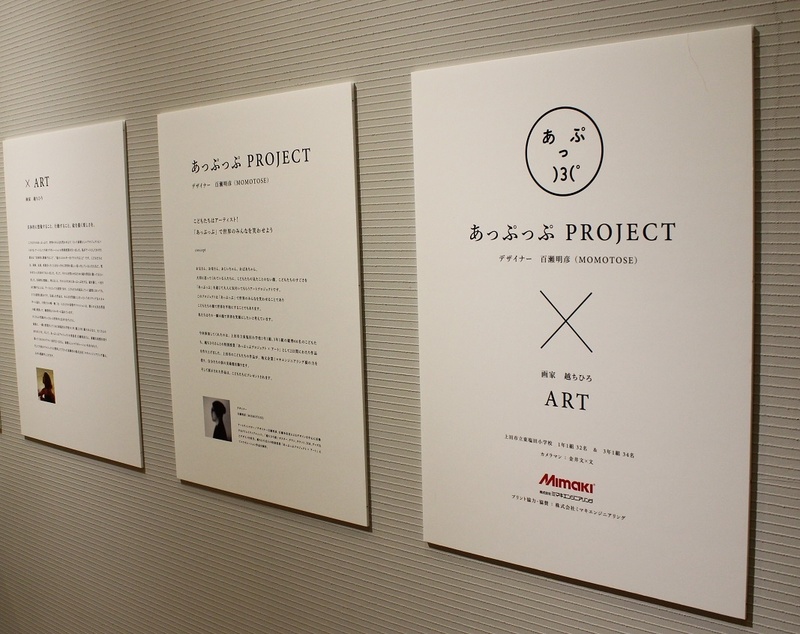 The art action, named "Appupu Project" that started with wish to make the world smile by a momentary face gesture. Taking the opportunity that Ms. Chihiro Koshi would perform a special lesson "Appupu Project x ART" to 66 children of 1st and 3rd year in Ueda City Municipal Higashi-Shioda Elementary School, in the same moment of Ms. Koshi's next exhibition, Mr. Momose of the designer suggested that Mimaki could cooperate to print the photos of the children on the panel. For the children to enjoy drawing well, Mimaki proposed an offer of canvas and produced the print with our flatbed UV curing inkjet printer "UJF-6042". * "Appupu" is a shout when playing with babies and small children in Japan. After saying Appupu, we inflate our cheeks and laugh your opponent. What is Appupu Project, "Designer, Akihiko Momose (MOMOTOSE)" x ART "Artist, Chihiro Koshi" Collaboration ? Children will be an artist ! Let's make laugh people of the world by "Appupu" ! 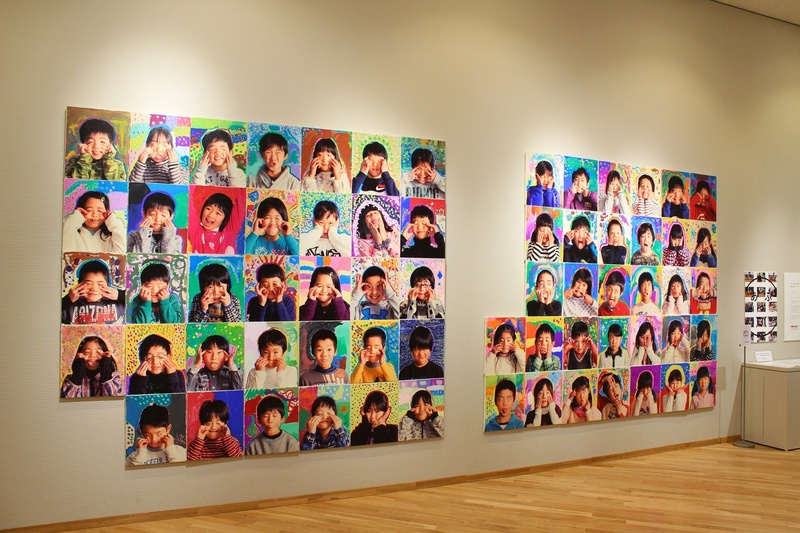 "Appupu Project" is an art action for people who cherish the children, through the "Appupu", to have an awareness of children's never shown faces and children's secret wonderfulness. The creative unit "MOMOTOSE", which works mainly around Mr. Akihiko Momose, an art director / designer who worked on posters and leaflets of "Chihiro Koshi", was launched and this time, as "Appupu Project × ART", with contemporary artist Chihiro Koshi Collaboration is realized. "Appupu project x ART" holds a special class to make works by putting colors in their own way by children to the canvas on which Ueda City Higashi-Shiota elementary school children's "Appupu" picture was printed. 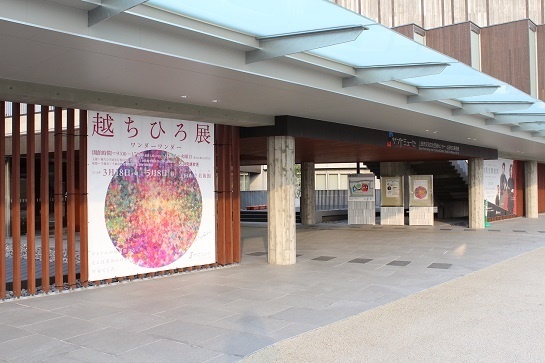 The finished work was displayed at the entrance of the "Chihiro Koshi Wonder Wonder" venue. "Because I am an artist who do live drawings ..., I saw for my first time to be suprised at the attractive print on the canvas." "Originally, the picture to be used for the special lesson was a monochrome. However, looking at the sample that Mimaki printed in black and white, that was already wonderful. As it was a really fine print, this might be more interesting if it is in color. And I concluded that it would be possible to express the unique 'individuality' and 'color' of children, including various children's fashion, with this reproducibility of Mimaki printer. A special lesson of 45 minutes x 2. The children exploded their personality there. "It was the point of this lesson that I wanted the children to think about for the first, to whom and why you like to make laugh and a message to them, so as to draw the background to make them laugh more. 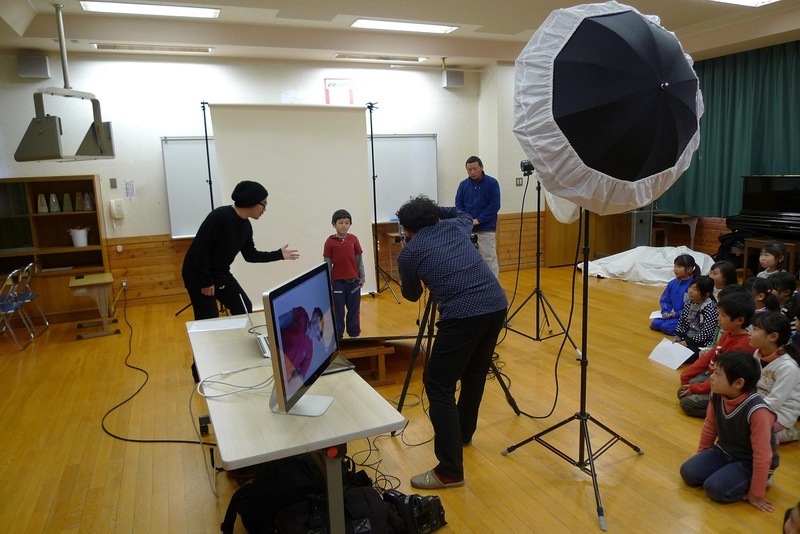 When photographing 'Appupu', a photographer had prepared full-fledged equipment, the children stood in front of a white screen and took pictures, but they were all nervous. But when the children saw their photo on the printed canvas and started to draw the background of their face, they changed completely. I think the canvas itself was also interesting. It was a material never used. Even in that sense, it seemed rather 'expressing a new thing', than 'drawing'..... .
"The line around the outline has no need to be a same color. ", "It's okay to keep it (color) like this or like that, any way is OK ! ", "No failure in art, do not be afraid to draw freely ! ", Ms. Koshi is advising to expand the possibilities of children. The photo canvases with everyone's full of energy are completed ! 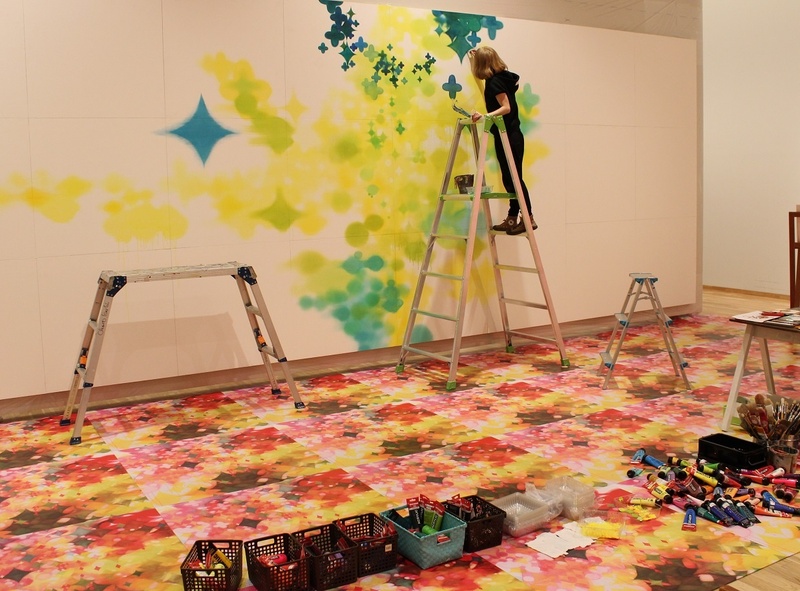 "The completed works were gradually lined up in the hallway of the elementary school. I found then they are absolutely the art, by mixture of the individual face being unique at 'Appupu' gesture of children and the color that each one's fashion has and the originality of their drawing and placing color method of no others can..... All the elements are combined to be an enormous power ! Born in Chikuma chity in Nagano in 1980. Graduated the painting course of art subject of Tokyo Zokei University in 2006. In addition to exhibitions of local and overseas, thru mural paintings such as Nagano station building and restaurants, artist's CD jacket, live painting to hit the life itself from physical expression with painting color, art offering to regional events, etc., she is exhibiting the possibility of art expression out of canvas frame from her local Chikuma to the world. Public production to a large screen of width 7.2 m located in the exhibition hall is also demonstrated. 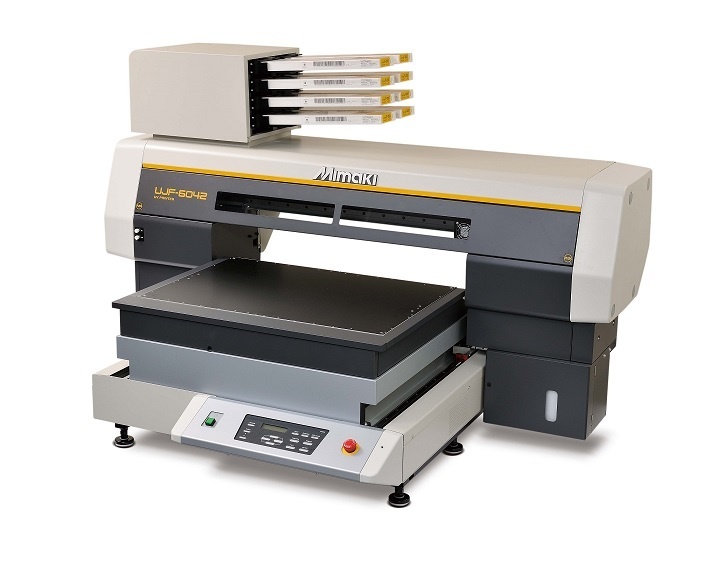 It is a flatbed UV curable inkjet printer corresponding to A2 size & height 150 mm of substrate, so as to realize the higher image quality.